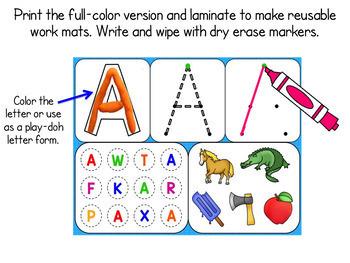 This is a set of interactive activities and printables focusing on upper case letters. 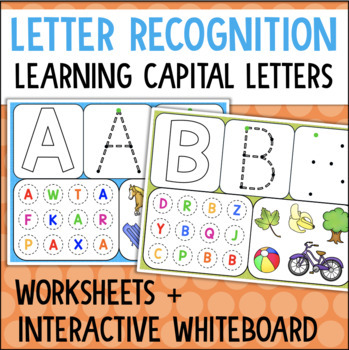 They are designed to help students recognize and write capital letters and identify words that start with the sound of each letter. ✪ Interactive Letter Mats: This is a full-color interactive Powerpoint presentation. It can be used as-is or imported into your interactive whiteboard program. Students can use the pen tool to color in, trace, and write the letter. They can also either use the pen to circle the correct letters or click on them to make a sound. Clicking on the correct pictures that start with the target letter also produces a sound. ✪ Black & White Printable Mats: This set is designed to be printed and used as a worksheet. 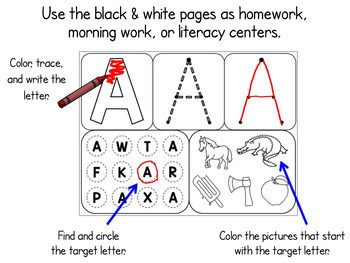 Students will color in the letter, trace the letter, and write the letter using the guide dots. They will also circle the target letters and color the pictures that start with the target letter sound. ✪ Color Printable Mats: This set is intended to be printed and laminated to be used over and over. Students can use a dry erase marker to complete the activities and wipe them off when finished. The outline block letter can either be colored in with marker or used to make a play-doh/clay letter shape.